This isn’t just a popular metaphor, it’s actually true. 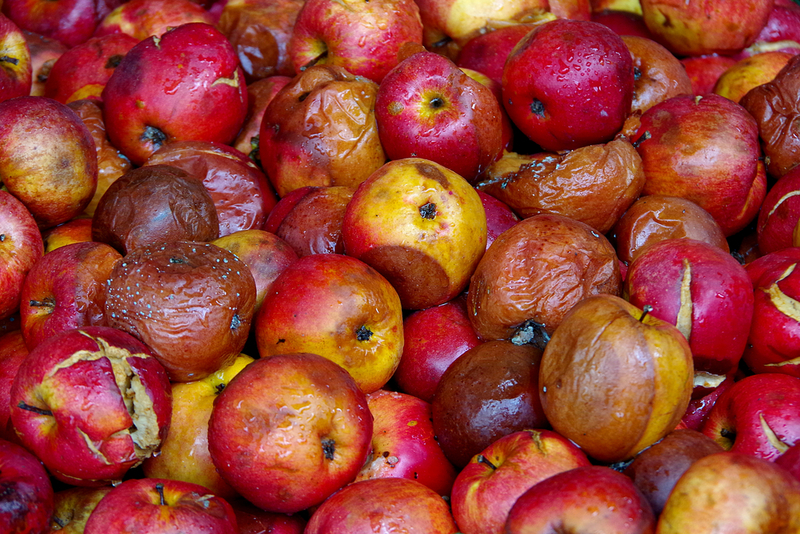 One bad apple will absolutely quickly spoil an entire box of apples. The obvious way this can happen is simply if one of the apples is infested with some fungi or critters that reproduce and spread throughout all the apples in a box, ruining them as they go. The less obvious, but perhaps even more common, way this can happen has to do with a hydrocarbon chemical known as ethylene. Ethylene is a hormone produced and released into the air by most plants, including from the fruit of certain plants, such as apples, bananas, pears, etc. So what does this have to do with one “bad” apple? The “bad” apple is usually one that is wounded in some way or is otherwise overripe. As a consequence to the wound on the apple, or if it’s just already very ripe, the apple in question will give off significantly more ethylene than normal. That ethylene accelerates the ripening process in the apples around it, which causes them to give off more ethylene, further accelerating the ripening process in all the apples in the box. In very short order, the entire box of apples will be overripe and eventually unpalatable for eating. Humans have actually been using ethylene to control ripening processes since before we knew about the hormone. The first known instance of this was in ancient Egypt where they would slash figs and place them with other fruits and vegetables in order to accelerate the ripening process, with the wound stimulating the production of relatively large amounts of ethylene. Today, ethylene is popularly used by banana distributors to partially ripen the fruit before the final distribution to stores. Bananas are picked when they are quite green and hard. They are shipped this way to allow them to be in transit for longer periods, as well as reduce the chances of bruising during transport. Once they are at the local distribution warehouses, they are often exposed to ethylene gas in a closed chamber for 24-48 hours to drastically accelerate the ripening process, making them ready for store shelves. Even if un-wounded, bananas put off large amounts of ethylene relative to many other fruits. In fact, if you’d like to speed up the ripening of some green bananas or other fruit or vegetables, put them in a paper bag together overnight. The trapped ethylene will quickly ripen the fruit, and the paper bag will still let enough oxygen in to keep the ripening process going smoothly. On the same token, putting fresh bananas in the same container as an overripe banana will drastically accelerate the ripening process of the fresh bananas, which is already quite a fast process. On the flipside, if you want to slow the ripening of bananas, put them in the refrigerator. Contrary to what you might think from seeing the bananas rapidly turn to brown and then black when placed in a refrigerator, this drastically slows the internal ripening process of the fruit. The skin will look like the banana is rotten, but the inside will stay tasty for up to about a week. So wait until a hand of bananas reaches the perfect ripeness, then plop them in your fridge to lock them in that state for about a week. No more bothering with the tiny window of eating opportunity normally presented by bananas left on the kitchen counter. Why Do Apples Turn Brown When You Cut Them? Why Do Bananas Go Bad Faster in the Fridge?